Whether you're a lifelong resident of the Corridor area, a University of Iowa student, or just visiting the area, you've come to the right place if you're looking for information about lodging, dining, activities, finding a good mechanic, a lawyer and otherwise in the Metro area! Looking for a refreshing dinner experience? Find a restaurant that intrigues you in Metro Pursuit. Have some relatives coming into town and need some entertaining ideas? Find some in Metro Pursuit. Need to move? Find a house or apartment to your liking in Metro Pursuit. Serving the entire Corridor and the metro areas of Iowa City, Coralville, North Liberty, Tiffin, Riverside, Cedar Rapids, Hiawatha, Marion and surrounding communities! Have some leftover ham from Easter? Here's a fun and VERY TASTY recipe. So you've got a bunch of ham leftover from the Easter dinner you made, or ham you were given to take home.... You can't just keep slicing a big thick slice of it off and eating it as is..... Well, you can, but there's no variety in that. There's the obvious, make a sandwich. Some ham, Swiss cheese, a little mustard between a couple slices of bread or in a bun.... It's another dose of YUM! You could grab a box of scalloped potatoes from your pantry, make the potatoes per the box instructions, chunk up some of that ham, throw that in before popping those taters in the oven and boom! Dinner. To add a little kick, finely dice up some jalapeno pepper to include in the mix. TASTY! You could do a similar thing by grabbing that box of mac & cheese from the pantry and in about 10 minutes, you'll have another lunch or dinner. Dice some ham up and put it in the fridge for later use. You can quickly grab that diced ham for a number of dishes..... Diced ham and scrambled eggs for breakfast; Diced ham on a salad; Ham fried rice; Ham & beans in the crock pot; Grab some tortillas to make ham & cheese quesadillas; open up a tube of crescent rolls and bake them up with ham and green onion. There's all kinds of things you can do with leftover ham, have fun with it! Here's a quick recipe for the grill - Ham Kabobs. Fire up the grill. While the 'outdoor stove' is getting warm and ready to receive, drain the pineapple, saving the juice for a marinade. Mix that pineapple juice, yellow mustard, clove and orange juice in a small bowl, set aside. Put the pineapple chunks, green pepper and ham on wooden skewers (you soaked them in water for about 30 minutes, right?). Grill for about 5-8 minutes over direct heat, basting the kabobs with the marinade and rotating frequently until cooked through. Makes a great appetizer or side dish! Today's weather forecast and a four day outlook. Check this page for the latest weather reports in the corridor area. Up-to-date weather conditions for the Iowa City area are observed at the Iowa City, Iowa City Municipal Airport, IA. For weather conditions specific to other cities outside the corridor area, just type in your zip code below. Cost $26 res., $32.50 non-res. All students who attend James Van Allen pay the resident rate. CHICAGO -- Kyle Hendricks struck out a season-high 11 over seven scoreless innings in his first win, and the Chicago Cubs beat the Arizona Diamondbacks 5-1 on Friday. Hendricks (1-3) became the third consecutive Cubs starter to go seven innings without allowing a run after Jose Quintana and Cole Hamels did it in back-to-back shutouts against Miami. The right-hander gave up three hits and two walks after losing his first three starts. IOWA CITY -- Weather permitting, beginning on Monday, April 22, 2019, lanes of traffic will be shifted on Muscatine Avenue between Wade Street and Second Avenue. In addition, northbound traffic on First Avenue will be reduced to one lane south of its intersection with Muscatine Avenue. These lane adjustments are necessary to facilitate the repair and replacement of a manhole and curb in the area. It is anticipated normal traffic will resume on Friday, April 26th. Motorists are to take note of this work and allow extra travel time as delays may occur. As always, caution should be exercised when driving through all construction areas. IOWA CITY -- Weather permitting, beginning on Monday, April 22, 2019, southbound traffic on Gilbert Street will be reduced to one lane of traffic near its intersection with Kirkwood Avenue. This lane reduction is necessary to facilitate street pavement repair in the area. It is anticipated normal traffic will resume on Tuesday, April 23rd. IOWA CITY -- Willow Creek Park, 1117 Teg Drive, will be closed beginning Wednesday, May 1, 2019 due to park renovations. The project is expected to be complete by fall 2019. 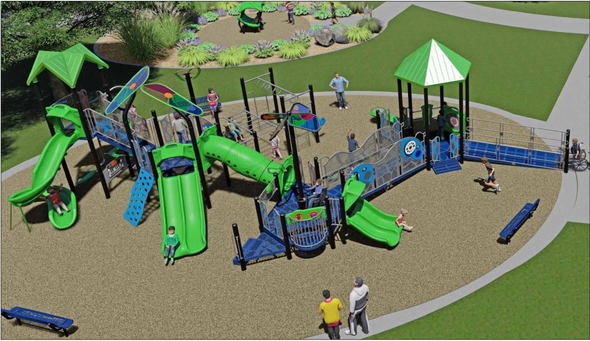 Renovations to Willow Creek park include new restrooms, shelter, and playground. Special attention is being given to creating a play space that is fun, inclusive, and accessible to a wide range of users. A public input meeting and open house was held on Thursday, August 16, 2018. Public comments were incorporated into the park plan. Park users are encouraged to use the adjacent Kiwanis Park during construction. IOWA CITY -- Weather permitting, beginning on Monday, April 22, 2019, eastbound traffic on Burlington Street will be reduced to one lane between Clinton Street and Dubuque Street. This lane reduction will facilitate work on storm sewer in the area. It is anticipated normal traffic will resume on Thursday, April 25th. CORALVILLE -- Weather permitting, on Wednesday, April 24, 12th Avenue will be reduced to one lane with flagger control on the bridge over Interstate 80. The lane reduction will start at 9:00 am and end by 3:00 pm. The lane reduction is needed for an upgrade to the Iowa DOT’s camera system used to monitor Interstate 80 traffic. The adjacent pedestrian bridge and sidewalk will remain open. For more information, please contact Assistant City Engineer Scott Larson at slarson@coralville.org or call 319.248.1720. To sign up to receive for construction and traffic updates, visit www.coralville.org/notifyme.